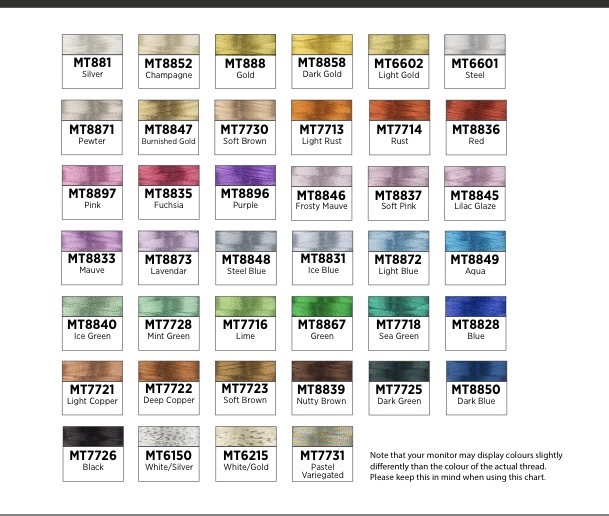 I’ll be honest…I have never liked metallic thread. For several reasons. Mostly because there wasn’t very subtle colors, and dear god, the breaking and shredding. I will say now that I am 100% on board with Wonderfil’s Spotlight Metallic. I ordered a few colors to test to add a sparkle of morning frost to a fall quilt I’m working on and they surprised the heck out of me by sending me a case of each of my colors. More than enough to do a few giveaways on my FB and IG accounts. But lets just talk about how the test went. My number one issue with metallic is that even when it doesn’t break, I feel like I can see the core and the “metal” part peels away. Well, that was the most obvious plus of the spotlight. That didn’t happen at all. Also, it always seems super fragile. Well, I used a TOWA bobbin guide and found a happy place at 180-200 with top tensioned out to match. That is actually pretty tight. By comparison a strong cotton or poly thread uses 200-250, and a fine silk top thread will need a 100-130. So, that tells me the thread is pretty strong. 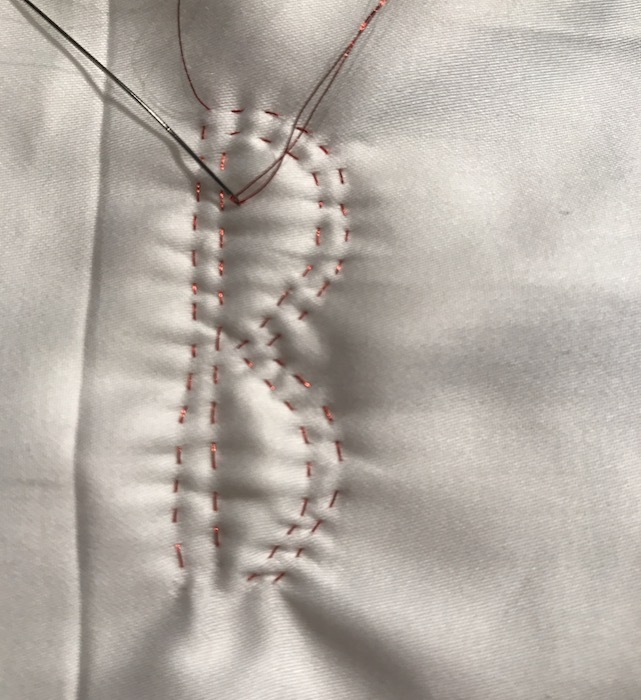 I did a very aggressive stitch out, with lots of direction changes, speed changes, stitch regulator and manual of different speeds on polished cotton with a high thread count. It is like a batik in density, but soft. I had basically no problems. At one point I got several breaks in a row. I had been using my left over size 18 needle from a previous project. I tried a fresh 16 size, but still had a lot of breaks. So, then I put in a fresh sized 18 and literally had zero issue for the remaining hour of stitching at all different speeds. As you can see, my back looks great…no tell tale sparkles of the tension going weird. That may have a lot to do with my awesome A1 longarm…but I suspect it has just as much to do with the thread. I used wonderfil’s pre wound bobbins, called Decobobs. Pre wound bobbins are a whole other conversation, but I think it is safe to say I think they are a GOOD IDEA. It took me a long time to convert (“I wind my own bobbins for free, darn it!”). 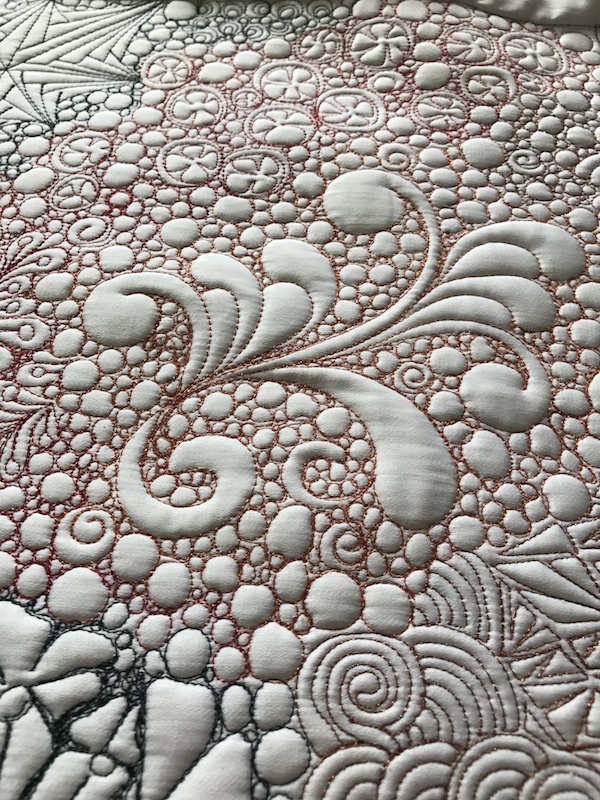 The even tension from start to stop and total lack of unpleasant surprises when I roll a quilt, makes the $1 each well worth it. I have tried several other brand pre-wounds and find them ALL superior to winding my own. Eventually though I have come to prefer the decobobs for their plastic bobbin case and matte 80wt. poly thread. The plastic is very slightly curved. This translates into never hitting it. With my metal bobbins (machine standard), or other brand pre wounds, it was possible to have the needle nick the bobbin on some direction changes if the machine is timed really tightly (mine is). Clearly, nicking the bobbin kills the needle and quickly leads to snarls and breaks. Anyway, back to the bling. I am very very pleased with the Spotlight metallic. It comes in actual blended colors, not just a crayon box of options. Time will tell if I actually use it on my show quilt…but as a product…two thumbs up!! 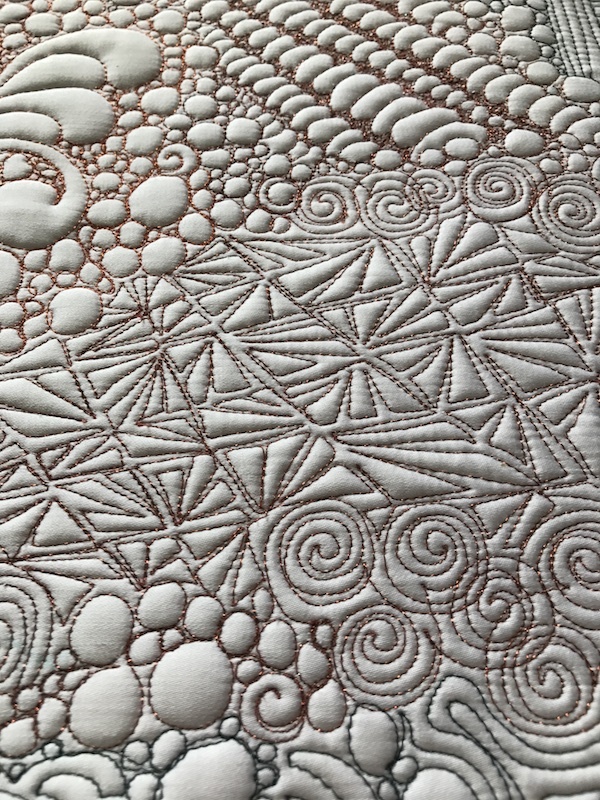 One of my Instagram followers asked me “how do you think it performs with hand quilting?” Well, um, Im a machine quilter. I hand quilted ONE thing, once, and decided I would turn into a skeleton before ever finishing, but hey, why not? Hold my wine. My tentative answer is it would actually hold up pretty well. I used the same fabric as above. The thread pulled smoothly with no “toothy” feel that most metallics have. It did not kink or twirl…unlike even normal sewing thread. It seemed to pull more like a waxed heavy quilting thread to me. I only sewed for maybe 10 minutes (Because, Good Lord. Don’t like hand quilting), however, I noted no fray or separation at the needle eye. Bottom line is that I think it is worth a try. Enjoy! Well, it sounds like this is definitely a metallic that might work for me. Thanks for the review! So very nice to hear and see your results! And, can you get decobobs in M class? I’m thinking I may want to give them a try! I haven’t tried Spotlight metallic. Thanks for sharing your positive experience with this thread, especially the TOWA tension and needle size that worked best for you. Are the Decobobs the same kind of thread as the Spotlight you had in your needle, or something complementary that coordinates? Did you do anything different with your threadpath or anything? Have you tried switching to just a nonfat, skim milk latte instead of cutting out your espresso drinks altogether? Some espresso beans have a hint of a carmel taste to them without any syrup added to the latte. Not Starbucks, but Lavazza espresso would be a good one to try. I feel your pain — I operate on four shots of espresso per morning, in two lattes that I make with my espresso machine at home. It’s my crack-of-dawn ritual and I figure there are WAY worse drugs I could be hooked on than caffeine! You answered a lot of potential questions in this one post. Thanks for sharing your experiences. Very interesting read. Thanks very much for the details and discussion of decibobs as well . Very helpful! This is great information. Metallic thread is a bugger. Think I may give them a try. Thanks Bethanne for your thorough review. 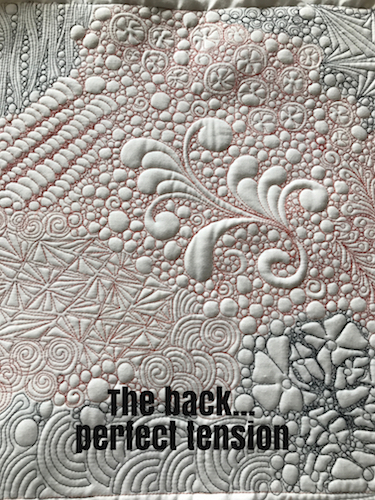 Balanced tension is very important to me as a quilt judge! You seem to have that nailed. Thank you for all the great info! I love sparkle! I entered the giveaway on Facebook too! I love that there are so many pastel colors as well! I wish they had an iridescent white! But I am going to have to try these!!! I love what you do. And , I use Truvia, which is stevia, in my hot tea in the morning, It has few calories and it is a natural source not a chemical sweetener, I like it now. And I have gone through caffeine withdrawal before; woo what a headache! I don’t drink coffee anymore, rarely, but I love my Diet Coke!!!! I have the Truvia too, and I am switching to tea. I don’t love the flavor, but it staves off the worst of the psychopath. Love the color choices. Like you, I don’t necessarily want the ‘bling’ but I do like to have ‘accents’ for lighting. Gonna have to give these a try. 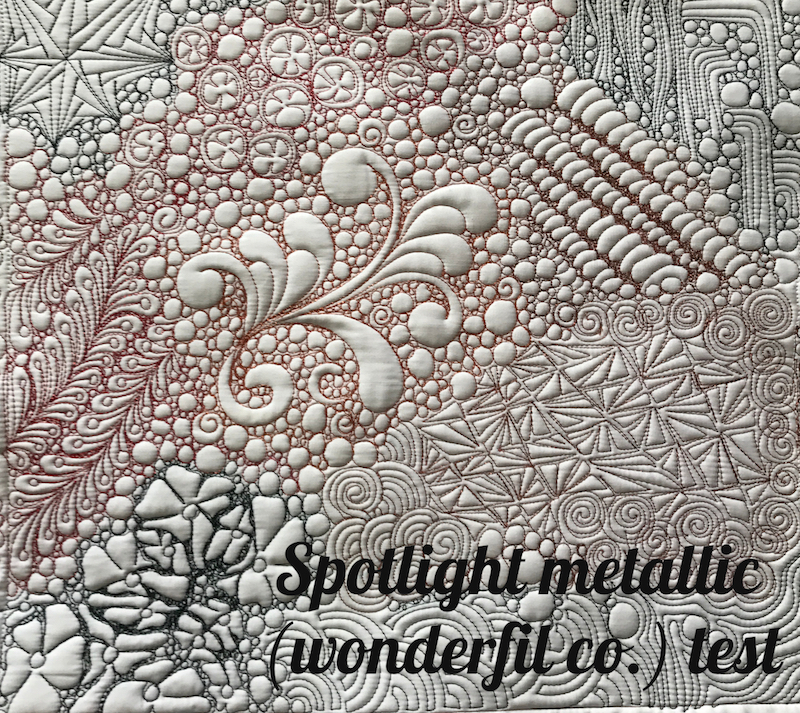 Thanks for the metallic thread review! I was also wondering about DecoBobs – I think the plastic case would help a lot – I frequently have problems with the cardboard sided which are sometimes wound too full. I have difficulty with the cardboard ones getting pierced, then opening up, which leads to worse and worse performance. I still own many of them, and use them with no problem by just tearing off the cardboard on the needle side. They are still a great product, I just prefer the plastic now. I will still use them till I€™m out. Hi Bethanne. Thanks for the post. 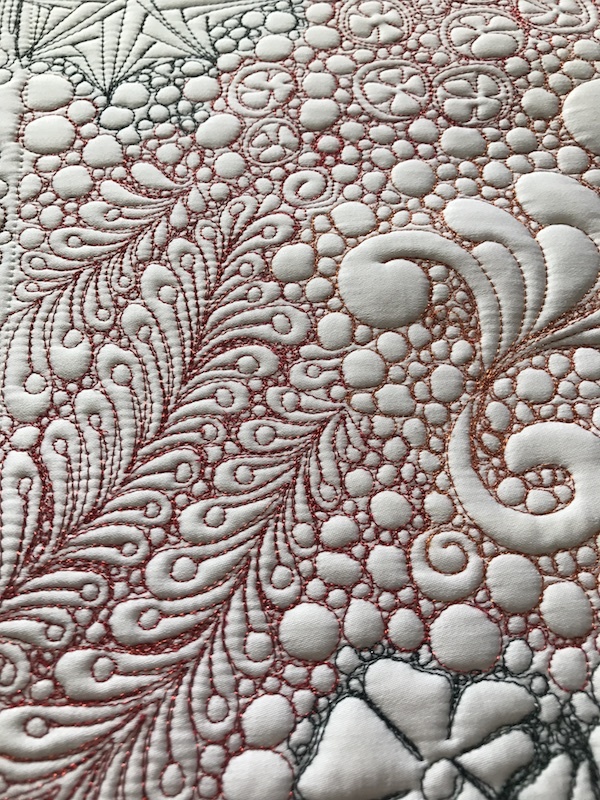 I struggled with curl back and kinking the last time I quilted with metallic thread. I will definitely try it again, but I wonder if you would share how you threaded your machine when using this thread? You have an A1 too I think. So, two holes on the first spindle, two holes on the second guide then the rest as normal. Other brands of metallic… I agree…peeling and kinking. I didn€™t have any of that with the Spotlight.